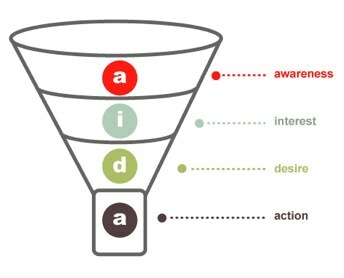 The funnel is a common visualization tool borrowed from the business world, where customer acquisition may follow a similar path. Many have applied this model to the admissions process, helping them to identify conversion points where schools can change their strategies for recruiting students. One big payoff of such a visualization is the ability to segment and measure against specific goals for each stage of the process. Noel-Levitz has published an excellent admissions benchmarking report. This is a good place to start if you’re unfamiliar with the concept of the admissions funnel or what the typical returns are. As you walk through the funnel, think about how you’d measure it. Our first step in using this tool is to figure out your goals and strategy for each stage. The goals are pretty obvious: submit an application, commit to the school, enroll, and actually show up. What makes a student consider your school in the first place? Why would they commit to you over your peers? What’s stopping them from backing out? 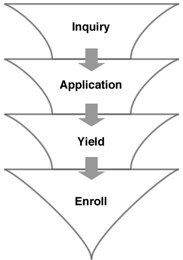 Breaking the admissions process into the funnel stages above can make this process easier. The goal in the Inquiry stage is to get the prospective student to submit an application. As with any product marketing, awareness is the first step to making a sale. If the student doesn’t know about your school and isn’t thinking of your school, they certainly won’t apply. But awareness isn’t enough. After all, how do you feel about Kia? Even though you’re aware of the Kia brand, Kia suffers a perception problem. How students perceive your school is a big factor in their decision to apply or attend. This is a reputation business, remember? Finally, the most effective tool in a salesman’s toolkit is the relationship. Having a personal investment in your school – even if it’s just because the student has spoken with your admissions counselor. One former admissions counselor I know is still friends with students she recruited years ago. And a growing number students know that it can work both ways – a good relationship with ones admissions counselor can make the difference in being accepted. The prospective student has applied and you’ve admitted him or her. That’s a good start, but now the goal is to get the student to Yield: accept the invitation to come to your school. Now you’re competing against their other choices; you might be their first choice or you could be the backup. You do this by first developing trust. Consumers (and prospective students) have a sense that there’s a difference between the recruitment and fulfillment. It’s great being recruited – there are dinners and tours and a lot of feeling like you’re the center of the universe. But now you have to show there’s something to all that. Next, you have to show your competitive advantages. What sets you apart from your competitors? And not necessarily your peer institutions, but the schools to which your prospect has also applied and been accepted. What relevant programs do you offer that they can’t? Better financial aid? More attractive intangibles? Great! Your student has applied and been accepted. She has agreed to attend, possibly sending a deposit and filling out additional forms. At this point, some schools assume their jobs are done. But this is also a tough stage for your most competitive students. If their dream school calls, you might not stand a chance. You have to combat buyer’s remorse. Your goal is to get the student to enroll for classes. In customer or client relations, it’s absolutely critical that you communicate the next steps to your customer. It’s a safe bet that your students have never gone through this process, so they’re likely overwhelmed and intimidated. If they are still considering other schools, you can stand out by helping provide assurance and comfort in a pretty stressful time. This communication helps set expectations. The only thing more important at this stage than setting expectations is that you deliver on your promises. It takes months to earn a student’s trust, but only minutes to lose it. Communicate when you say will, provide those great services you promoted, and help them achieve those goals that got them to apply and yield in the first place. Finally, you need to pass the relationship on to those responsible for current students. It might be student affairs or various colleges. At Notre Dame, we have a school dedicated to helping first year students with all the challenges of the transition into college life. But it can’t be a “toss it over the wall” approach – you have to make this experience consistent. When you hand the relationship off, the students still have expectations (that you set) and you want to ensure that someone delivers on those promises. Just killing some time on Digg and I found your article . Not typically what I prefer to read about, but it was absolutely worth my time. Thanks.